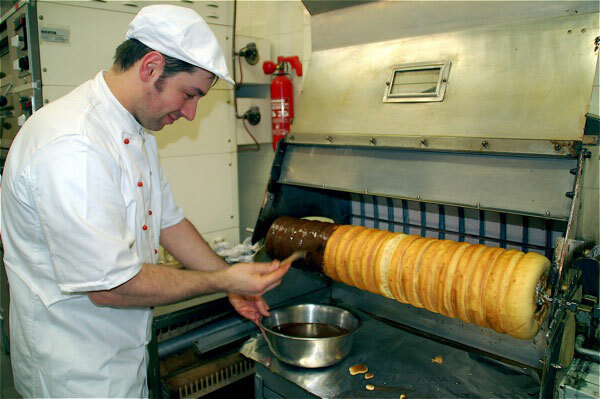 Today I learned about a cake that is baked on a spit for several hours and is called Baumkuchen, which means Tree Cake in German, because some of them are cone-shaped like a tree. These cakes date back to the Middle Ages, and currently are pretty popular in Japan. I read about poutine, beloved especially of youth in Canada, where I think I could get into eating it, at least in winter, when one might be able to burn enough calories shoveling snow and keeping warm so as not to put on the pounds from enjoying a dish that consists of French fries, cheese curds, and gravy. The Michelin Guide to restaurants took several pages to explain, after the author hung out with one of the inspectors for the company during a meal at a three-star restaurant. These inspectors and their identities are top-secret and incognito, so that they can remain objective and also get the same food and treatment as any old customer who is willing to pay dearly for their daily bread. Later in the morning I read a blog about how good homeschooling can be if the family actually stays home a lot, so that the children can concentrate on whatever it is they are doing and not be constantly interrupted by having to run hither and thither to group classes and such. That got me thinking about how it is better for me, too, still a self-homeschooler, an autodidact, who always gets confused and scattered when I have to come and go. I read another blog that linked to an interview with Makoto Fujimura, a Christian Japanese-American artist who has a lot to say about God and creativity. I remembered that I’d heard a different interview with him not long ago on the Mars Hill Audio Journal, and I was able to locate the tape and listen to him. I was not able to multi-task, though; I found that if I tried to find his website at the same time, I stopped listening. I started to take notes on the audio interview. He was talking about how the habit of reading is even more important to cultivate now that our society is so image-oriented. Also about how all the fast-action images that people are feeding on teach their minds to avoid real concentration. They scan, instead of engaging with visual information in a more focused manner. I was still feeling distracted myself and wondering why I was picking this one topic and writer to think about. Was I randomly and shallowly scanning? No, I had wanted to listen to him again and think more about these things. But if I hadn’t gone to the gym and taken hours to collect myself afterward, I’m not sure I’d have had so much trouble being calmly thoughtful. In the early afternoon I had to go out again and run errands–more dissipation of mental energies! I was saved by duty–my husband’s needs were what helped me to pull myself together. We were nearly out of granola, his staff of life. And he would need a real dinner. (Without him, I’d eat eggs and toast and tea forever.) He would like to feel the warmth of a fire as he came in the door from work. When I got a fire kindled and started assembling the granola I was happy to give my attention to concrete and practical tasks. This granola has fed the family for more than 35 years. I make a huge batch still, so that I don’t have to do it very often, even though B. often eats Power Pancakes for breakfast nowadays. The basic proportions of oats, honey and oil have remained the same, while the extras of nuts, seeds and other grains are infinitely flexible. It doesn’t make a very sweet cold cereal, as you might guess if you compare with other recipes. Put 20 cups of the oats in a giant bowl. Add whatever other dry ingredients appeal. In a pot, heat and stir the wet ingredients gently and slowly together until the honey is liquid. Pour onto the dry ingredients and stir to moisten them thoroughly. Then add the other 10-12 cups of oats and mix in evenly. I store a gallon jar of this on the kitchen counter, and the remainder in the freezer. I was going to show a photo of the big bowl of finished granola, but my camera battery is spent. 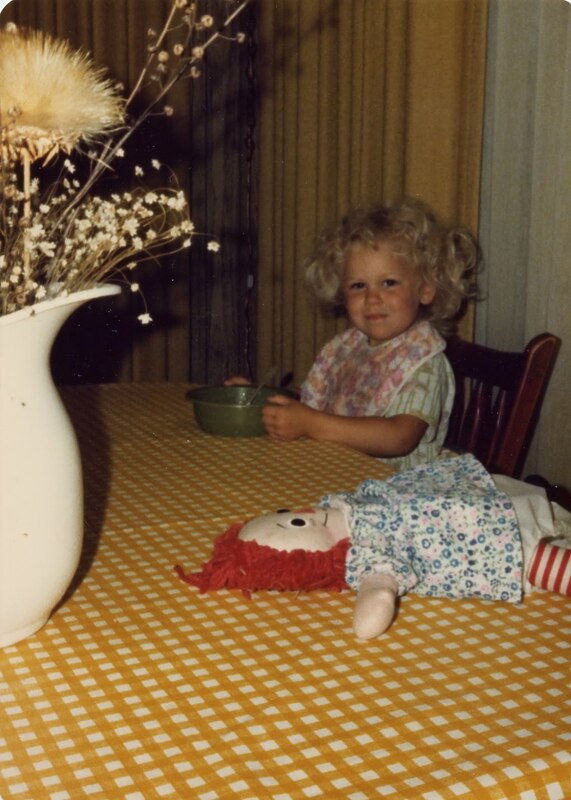 So here is a picture of someone enjoying an early version of GJ’s Granola, circa 1977 (notice the gold draperies and tablecloth). Time for bed now, and thank God, I can end the day having accomplished reading, writing, and homemaking, even if I wasn’t very organized in my concentrating. I want to do better tomorrow.